We will love your pets and look after your home! We are a happy, engaging, reliable, non-smoking, healthy couple in our mid-50's. 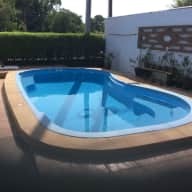 We enjoy the experience of discovering new places & cultures, meeting new people, spending time at the beach, swimming, walking, gardening, photography, art, good food and of course, taking very good care of your home and much loved family pets. Our first foray into the house/pet-sitting world presented itself in 2017 when friends of friends invited us to look after their home and dog whilst they travelled overseas. We enjoyed the experience so much and as word-of-mouth spread, so did our requests to do further house/pet-sitting. We both love animals of all types and have in the past, had our own pets including dogs, birds, fish and turtles and have been animal foster carers for the AWLQ. As we also love to travel and I'm semi-retired and work freelance in the travel and publishing industries, and Dan recently retire after 30yrs working for the Australian government, we are keen to travel more, near and far. Now, being at an age where we like the idea of spending more time in the one place when we do travel, the house/pet-sit lifestyle offers us the best of both worlds. We can explore new places whilst enjoying the company of animals, ensuring they are happy and well cared for in their familiar surrounds whilst you enjoy your own holiday with the peace of mind that everything at home is okay. We have experience looking after both small, large, young and old animals, and those which require regular medications. Through referral and repeat invites, we have been privileged to complete several house/pet-sitting assignments in Brisbane and the Gold Coast. 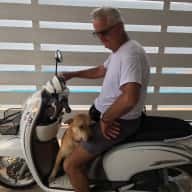 When we registered with TrustedHousesitters, we planned to broaden our travel opportunities and were thrilled to bits when our first application to sit in Thailand was accepted! Jane & Dan are great housesitters. They are friendly, organised & just love dogs & the feeling was mutual by our 2 Springer Spaniels. Their direct approach & strong communication before & during the sit gave us a lot of confidence. Whilst we were away they watered & tended the garden, kept our home spotless & Dan washed down the decks all whilst feeding,walking & loving our doggie family. If they apply to sit for you, just say YES. Jane & Dan were fabulous. Our dog & house were very well looked after. Everything was spotless when we returned & Scarface was very happy & had had a bath ! They went over & above our expectations. Will definitely stay in touch. Jane Wilson and Dan Pigatto looked after our much loved 7 year old dog Pablo and our home for 2 and half weeks in July/ August 2017 whilst my husband and I travelled overseas. They took amazing care of our dog and our home and we couldn’t have felt more comfortable and confident with leaving them in charge. They were so prompt at contacting us to reassure us when Pablo required a trip to the local Vet due to an existing health problem and handled the situation wonderfully. Pablo was in great hands. It was very evident that they took great care of him. Jane and Dan are reliable, responsible and trustworthy and I would highly recommend them as house/ pet sitters. We look forward to having them take care of our home and dog again in the near future. Madonna and Antonia, Brisbane, Queensland, Australia. Jane and Danny Pigatto stayed in our new apartment on the Gold Coast for four weeks during August-September 2017 to look after our beautiful 11-year-old Labrador. The one meeting we had with Jane and Danny, to run over a few things, filled us with confidence that we were leaving ‘Chilli’ in the best hands possible. Our confidence was confirmed upon our return with the Resident unit manager and many of our neighbours commenting on the love and affection Danny and Jane showed towards Chilli. On top of this our apartment was well looked after and was presented better than when we left. 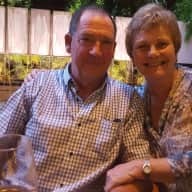 My husband and I would not hesitate to recommend Jane and Danny as professional, reliable and trustworthy house sitters. We will certainly be using their services in the future. Phil and Deb, Gold Coast, Queensland, Australia.